I read about a recent Skeptic conference, where someone was going around asking the participants what they were grateful for. Most participants were thankful for things like friends, family, science, medicine, having a job. One participant, however, rejected the question itself. 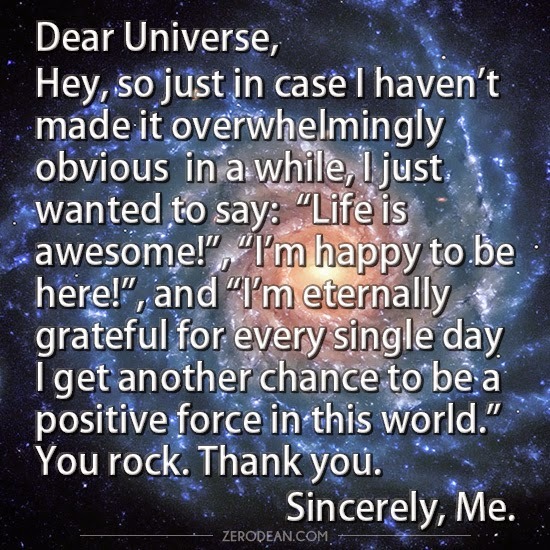 He said that asking people to be thankful for something was an attempt to “anthropomorphize the universe.” He said there were lots of things he liked — being alive, his wife, his kids, squid — but he wasn’t going to express gratitude to the universe, since the universe wasn’t capable of expressing any gratitude back. I get the point about anthropomorphizing the universe. Yeah, I kinda do that when I say, "thank you, sky, for being so blue and clear today," or "thank you, October, for being so lovely," or "thank you, universe." There's a hint of anthroporphizing in there. It's a fiction; I know that. But fiction is good for you. Reading novels shows us important truths about our world and ourselves. Good fiction changes us, broadens our understanding, makes us wiser, and it does this even though we know it’s fiction. While some at the Skeptic conference reject gratitude because it implies a person-like recipient, some theists embrace gratitude for the same reason: it implies a person-like recipient. Yet let us remember that there’s a long, long continuum stretching between the barest hint of anthropomorphizing which our brains inevitably do and which we can recognize as useful metaphor (at one end) -- and devoted commitment to a superpowerful male-gendered judgmental and bearded father-figure in the sky (at the other end). Thich Nhat Hanh, the Vietnamese Buddhist teacher, described an encounter he once had. It seems pretty clear that, yes, we can be grateful for beautiful days, for springtime flowers, the summertime feel of bare feet on grass, autumn colors, winter logs in the fireplace, sunsets, beaches, apple trees, and wild geese that fly with the moon on their wings – even though none of those things intentionally chose to give us the gift that they are. Sometimes intention and choice are relevant to our gratitude – as when I’m thankful to congregation members for the things they do that make our congregation the wonderful community it is. Sometimes intention and choice are not part of the picture – as when I’m thankful for the birds outside my window. Sometimes gratitude functions to make another person feel affirmed and appreciated. More fundamentally, though, it’s about deciding to be glad about things. It’s about practicing the art of finding delight in things that you didn't make happen -- things beyond your control and maybe beyond anyone’s control. It is such a great thing that there is so much beauty and abundance and I’m not responsible for it. It just happens. I can plant a seed and water it, but I can’t make it grow. What I can do is decide to pay attention to how delightful that is. This is part 2 of 4 of "Gratitude and Its Expression"